SaveDunwoody conducted a poll that was open to all Dunwoody residents. The poll was publicized through advertisements in the Dunwoody Crier newspaper, letters to the Editor and on social media. It ran for 100 days, between early February and May, 2013. There were 1,397 responses, including 262 paper ballots and 1,135 online responses. Hundreds of additional comments from the poll are also included below. Tell them to stop railroading us into something we don't want and especially do not want them spending our money on unimportant things. I think a roundabout at the Womack/Vermack intersection is a GREAT idea! It will improve traffic flow without increasing speed like a traffic light would, and it will reduce the need and ongoing cost of having a police officer direct traffic. Let's "vote the bums out"
It is evident that Dunwoody citizens have been fooled into accepting another layer of government which is unable to accept the will of the locals! I am very disappointed in the direction our city is going. Bike lanes to NOWHERE! Cut out car lanes and add to the congestion at busy times. These Reps need to ask "then what happens". I regret voting for the Mayor and suggesting him to others. I also do not approve of the intersection changes at Tilly Mill. I dirive it everyday and what you have proposed will not help. Also, it only takes me a few minutes to get through that intersection coming from PIB -what is the big deal? This "improvement" would cost over 3,000,000. Why isn't this one on this survey? The intersection of Tilly Mill and N. P'tree should have been restriped years ago to allow traffic turning left from T. Mill onto N. Ptree south not to block T. Mill traffic from moving North thus causing traffic to build light after light towards Home Depot. Again... SHOULD HAVE BEEN FIXED YEARS AGO AND DOESN'T REQUIRE ANY FURTHER MODIFICATIONS OTHER THAN RESTRIPING, Why does this even need a review from a traffic engineer to figure out? I am not opposed to change. I think change is good. But the proposed changes are not good and clearly there are a lot of people opposed. No matter how these decisions were originally made, the people who live here and pay the taxes here aren't happy. Dunwoosy is a residential are and has enough shopping! Would much rather $ earmarked for Dunwoody Village project used to intersection of Chamblee-Dunwoody & Mt Vernon to match improvements at Mt Vernon & Ashford-Dunwoody. The bricked cross walks has a huge visual impact & the Farmhouse intersection really looks horrible. Entire Council and Mayor have invented a mandate that they never had.. They need to be replaced as soon as possible with practical, pragmatic leadership. Our elected representatives need to listen to their constituents! Dunwoody Village Parkway has to have the impacted land owners and business owners show initiative. A walking downtown Decatur feel with mostly businesses and restaurants would be great. Meeting us halfway would be to do something like what's between Target and LeeBrant without the high rises. I need a whole solution, not just a road narrowing to encourage bikers. If that's all we get, then I say NO instead. You should include "not sure" as an addition answer. And it might allow the insite for what everyone really desires. Sometimes a good compormise works best for all. I am not completely opposed to all of these projects in their entirety. I am open to change and embrace progress. At the same time, I believe that the people of Dunwoody should have a say in projects of this magnitude. These projects affect us in so many ways. Maybe it is time for a recall election! Council does not listen to citizen input and seems determined to "have their own way"! To all the folks whom tried to talk me in to another layer of government, please take a seat. Lost we are. This poll was worded in such a way as to encourage certain answers. A true poll should not introduce bias for the purpose of soliciting a certain response. Though I do not agree with 100% of the council's decisions, those cited within this survey seem to enhance our city with regard to commute, safety, walkability, and traffic management. Why hasn't this group commented on the proposed curb-cut along Ashford Dunwoody, taking a traffic lane out and impacting the community profoundly in this part of the city? Wake up! This town needs major improvements, let's spend some money and work towards losing the nickname Dumpwoody! Regarding DVPkway, I would be in favor of keeping the median with trees and taking away 1 lane for a sidewalk and bike lane. The intersection and traffic debackes at Womack are a nightmare. I purposely drive away from this intersection during school times. The council is overly impressed with their own importance. You elected a- friend- of- developers-mayor. The same can be said for some of the commissioners. We're reaping what the majority sowed. Follow the dollar. Stop being so opposed to change. We need a more walkable and bikeable community!! Dunwoody needs to move into the 21st century -- progress not "Leave it to Beaver" is the new utopia. I was blocked from responding to questions 3 and 4. Both "no"
Present Mayor & Council, are NOT prudent stewards of taxpayer money. They also are NOT HEARING THE WILL OF THE CITIZENS. Thanks for conducting the poll. I do have to say that it is interesting to me that the same people who are vehemently against one of the three projects are vehemently opposed to all. They are all different have have different merits and demerits. I have lived in a community with roundabouts and they quickly become popular, work well and without serious accidents. council is arrogant, they run things just like a corrupt small town. i voted against becoming a city for this exact reason. My husband, wishes to add his name to the opinions expressed by me, so count this as 2 votes against our city council and our mayor. Hopefully the next Council will listen to the residents. Regarding the parkway, the trees there now are in bad shape, unhealthy. The parkway idea is not all bad, but if Dunwoody Village is to be revitalized per a master plan, as we have been told, then the parkway is the LAST thing you would reconstruct. It will be destroyed by any future construction activity. The Council is either short sighted, not telling us something or both. I strongly suspect "C". What do you guys think about a Dunwoody School System? You have a new politically active group, we'd like to know what you think The issues are not static neither should you be. I'm not happy with the mayor. If Dunwoody wants to compete with Roswell etc, we need more parks, a more walkable/bike rideable community. That's a major draw to families to our city. I love Dunwoody, but always use Roswell parks and bike trails. If I knew then what I know now, I would have bought in Roswell. Our council seems to be on a very dangerous spending path without regard for citizens safety (round about) or protecting our environment (tree removal). We as citizens need to be wary of our current council and mayor. They seem to be working their own personal agendas. The council is not listening to the people who voted them in and seem bent on finding ways to unneccessarily and carelessly spend our tax money. why weren't the residents given the opportunity to vote on these? I just heard they were going thru and I had been waiting for voting information. This is totally against our democratic way in the USA. How can we have a coucil that just push things through without the opinion of the residence who have to live here??? ?Please consider again and do the right thing! Vote out all the elected officials in the next election. Thank you for giving Dunwoody citizens a voice. I hope it has an impact. Thank you for the opportunity to vote on the above poll. Change the term structure to 2,2-year terms electable when we get to vote for State rep & sen.
No off year bond or tax referendums. No special elections for bond or tax year referendums. Capital projects must be put out for referendum. Take away Messers Hutmacher & Smith’s city vehicles and issue them bicycles. NO behind closed door land deals. I’ve lived here 50/years – helped form Dunwoody Homeowners Assn. We do not approve these changes – whoever wants these changes – let’s see their money up front to pay for them – otherwise keep their mouth shut. These people have to go – all of them! Fire Mike – he’s gone nuts! No sports complex at Ashford – Dunwoody & 285 – outrageous! Removing the two traffic lanes from Village Pkwy. will turn Chamblee Dunwoody Rd. and Mt. Vernon into a traffic nightmare. Keeping the quaintness of trees, flowers, etc. and shopping adds to the beauty of Dunwoody. More cement, buildings, apts. & walkways destroys the charm of Dunwoody. In 1979 more children and people shopped and hung out at the Village Parkway. We don’t need apartments, condos and walkways and biking for rentals in this area. Where is the charm of Dunwoody heading? Thank you so much for doing this. We need to get rid of the mayor and council also before they ruin us! We need sane, conservative people to run for these positions! Wish I could run, but I’m getting to be an elder lady. I’m willing to help out with a recall petition! Why is it NECESSARY to make these changes????? The initiatives are good for building new cities but should not be FORCED upon functioning neighborhoods. I think all these changes will improve our city to create more bike and pedestrian access and better traffic management near DHS which is a nightmare every morning and evening. I support the City Council! Change is never easy and rarely embraced. Yet change is necessary. Imagine where our city would be if we'd voted not to change anything (we might not be a city). I believe our City Council did a good job seeking public opinion during numerous public meetings when drawing up the master plan for our city. Now we need to let them proceed and stop all the complaints. Let's move forward. I approve of building a trail at Brook Run, but I think it could have been done without the removal of so many trees. I also think we need soccer and ball fields at brook run. Brook Run would be a great place for an in-door pool that could be used for the entire community since the high school has a swim team but no pool. We could use the pool for major swim meets. Dunwoody Village Parkway works just fine -why fix something not broken and remove trees? Removing a lane will cause traffic snarls. What is wrong with the council that sets this as a priority?? I am disappointed by the apparent level of interest that the local Dunwoody government and HOA are giving to the interests of the actual citizens of Dunwoody. Not sure who exactly is pushing the agenda for big money projects and commercial interests. Much appears to go on behind the scenes and during times inconvenient for the working public to participate. Thank you for the work you do! city leaders need to repaire the roads first. our roads in dunwoody are deplorable. davis and his crew DO NOT listen to the citizens. i will not vote for any of them in the next election. Education and property values with fiscal respondsibility should be primary. Bringing new business into Dunwoody and creating more of an economic stimulus would help generate the monies for these proposed projects in the future. I think it's important to look at each of these issues individually rather than as a collective. I am in favor of both the roundabout and the parkway. My family walks frequently and I see both as a definite improvement over what currently exists. Thank you for allowing me to voice my opinion. I like some things and dislike other things about the direction of the City Council. Thanks for creating this survey. It's a good idea. I certainly understand your positions and respect your right to voice them, but the disrespectful behavior during city council meetings really needs to stop. All I hear is complaining - complaining about what Dunwoody isn't and complaining about the changes proposed to make it better. Let's stop complaining and make changes to make Dunwoody as good as it can be. Dunwoody needs to move forward! I am not happy with the above 3 initiatives and the way they are being handled. I am not happy with the disrespect the mayor shows to citizens in City Council meetings. But, I am very happy at the work the council is doing to go for Dunwoody City Schools! Your poll questions are skewed to produce negative answers to every question except the city council item. You should be embarassed. Not all change is bad! Doing nothing should not be an option for a growing and thriving community. If we are not willing to change some things to improve our community, we may as well be dead. What actions do we hope to get from the results of this pole? After such a long journey to become a city, it's disheartening to find the mayor and city council so focused on their own agendas rather than listening to the voters of Dunwoody. I will not reelect the mayor or any city council member. For the life of me, I can't figure out what happened to the notion of Dunwoody people having a say in the governing of its city. Apparently the rules by which we are being governed need to be reviewed! Interesting that you failed to mention that some of the cost will be shared by the Gov. would like t insure none of the current council members gets re electedThe Mayor and Hutmaker need to goThey are as bad as Vernon Jones. All of these issues should been brought up in the last election. I understand your concerns, but the tacky yard signs are a real eye sore. Will they be up indefinitely? Construction on Brook Run has already begun; at what point do you concede defeat? I believe that this poll is biased and will not be meaningful, in spite of how it will appear in the Dunwoody Crier. These projects are only the beginning of the Dunwoody Governments projects. Dunwoody wanted to save the PVC lots from development. Mayor Davis now wants to build 100 houses on reduced zoning requirements, different from existing land lot sizes. Anybody want more traffic on Chamblee-Dunwoody Road? these 3 projects are totallly ridiculous. Every day I use the Dunwoody Parkway. There are always 6-8 cars ahead of me most of the time. The light takes forever and a lot of the time I have to sit through the light 2x. How bad is this plan - bad! Whoever thought this up has never used it daily at all different times of the day. My husband and I have always been against this. I could never imagine this plan looking good. Are they going to tear down the banks, Post Office and any other building so close to the street? This is the biggest pipe dream. Over the short time the Dunwoody City Council has existed it has done an excellent job representing the will of the local residents. Since the last election or so, not so much. One has to take stock in what changes have taken place over the last year or 2 and understand some currently on the council are deciding how they wish things to go personally, regardless of the will of the people. They NEED to be removed from office. Any representative body that would balk at spending $70,000 to move a widely used dog park while spending millions to revamp a 1/4 mile stretch of road in the mold of Old Norcross or Duluth, has lost its way. Dunwoody is far from either. A major business district lies just 3/4 of a mile away, housing corporate offices for many companies. A facade representing an old Georgia town is embarassing to say the least, and a terrible waste of money. Our tax dollars are not designed to fund someone's personal view of OUR city. In addition, building a complex traffic hazrd on a corner adjacent to a high school, with all the new drivers traversing the area daily, is criminal. If there is an issue with a simple 4 way stop, put in a traffic light. Think there is risk there now? Wait until distracted students try to hurry to class, or home, via a traffic circle. Most will never have seen one, let alone properly executed the required diligence to enter or exit one. Again, where does the will of the residents come into play? Need to focus on traffic -- turn lanes and lights to avoid traffic tie ups when someone is trying to make a left turn. poor follow up on reports to Dunwoody police. I also think that the Dunwoody Police hasn't done or isn't doing a better job than DeKalb. I currently have a case that has been open for a couple of years and every time I try to call to see the progress no one has been able to tell me anything and I haven't had anyone call me back. I even tried to escalate the call with no resolution. If you are afraid of cutting down trees, then I guess all housing projects, office building projects, stores, etc. must be stopped immediately. Look at the use of the silver comet and Greenway. We have lived in Dunwoody 17 years. We were for being a city, but do not like big city dollar spending the way it appears to be headed. Please city officials listen to the dunwoody citizens that elected you. I agree with almost every letter to The Crier concerning these projects. A 12 ft, or any width concrete "trail" in woods is idiotic. It`s supposed to be natural in woods, not a road for everyone except walkers! We may as well go back under Dekalb County. Ask the residents of Dunwoody to vote on what they want before spending money on things they don't want. I believe our mayor and city council are interested in only what they want done without regard for what we the citizens think is right. We are not Roswell and it really only consists of one full block on Canton St. with some restaurants and shops scattered about. Dunwoody village wil not attract what our mayor and council think they will attract business wise. Also where do the bikers go after they leave the village since the bike lanes on Mt. Vernon and Chamblee Dunwoody aren't big enough for bikes. We have lived in dunwoody 40 years and can't believe that it would be even considered - changing Dunwoody Village Parkway. How can that be a "downtown"? I am wondering why the old Dunwoody Village can't be made more attractive by planting trees, etc. in the bare parking lot and promoting the businesses there. Years ago my family liked to walk around there and there were some good stores and businesses --- Bells, Hallmark Cards, Pepperidge Farms outlet store, a toy store and others that I can't name offhand. Why should that area be left as a wasteland when it could be made attractive for walking, etc? Changing the parkway and cutting the trees has to be the worst idea ever! Please let them build the bike path, we really need one-- we can make up for the lost trees by planting more hardwood trees through the city.--Please.. we do want this bike route.
! would like to support Save Dunwoody, where and what can I do? The city of Dunwoody government seems to be like a dictatorship that is not listening to the people. I have been to meetings and nothing changes!! My street hasn't been paved in 15 years and to think we are taking down trees that take 50-60 years to grow is unconcionable. Removing the 2nd lane around the parkway is the dumbest idea EVER. These people need to be stopped. all this for bike lanes absurd!!!! The parkway improvement is family friendly! We voted for the city of Dunwoody to escape miss use of funds by Dekalb County now we see the same thing happening in Dunwoody. Start a recall.I agree with a lot of the setiments expressed in the Talk Back to the Crier comments. We do not need projects "crammed down our throats". stop the fraud! Fix the STREETS !!!! What's more important? Is a recall election a possibility? It is insane that we are not converting existing roads within Brook Run for mixed use trails instead of pouring cement. "Save Dunwoody"? If you mean the Dunwoody of the 1970s, then count me out. Those days are gone. Take a look at Dunwoody "Village" and tell me it deserves saving. If your vision of government is to operate a police force and build roads for drivers, then move to Gwinnett or Cobb or some other automobile slum. I don't agree with everything the city wants to do, but at least they have a vision of the future of the community. Your organization just seems to possess a negative NIMBY attitude that wants to preserve an auto-centric mode of living that will have no future. Even the name of your group is backward-looking. Hey, since we're saving Dunwoody, let's bring back the Turtles Record store and Versitile Video. Maybe we can resurrect Bruno's Grocery. Hell, why not have the Sprurill family come back and graze cows next to Perimeter Mall. We'll party like its 1979. This Mayor has been so bad for Dunwoody, it reads like a bad dream. I have to wonder what motivates him. I do support a recall election. The letters to the editor in the the February 27th Dunwoody Crier were very enlightening. Our comment about Mayor Max Davis is - throw the bum out. If you had asked if i liked the attitude of our city council, I would have voted no. Every member, except Adrian Bonser (actually listens), should be removed from their office along with Mayor Davis. Recall Nall! Dump Davis! Thump Thompson! Silence Shortal! I voted for the city of Dunwoody. I thought that our elected officials would listen to the people of Dunwoody! They are turning into typical elected officials, only listening to a few friends and their own gain-Not the welfare of the people. Look at our streets! They are a mess. Look at Sandy Springs-their streets and improvements look great. We need to remove those in charge. Lets take our money and spend it on getting our own schools, lets do something that has a real and positive effect on our kids! If we don't like what's decided, then don't re-elect those individuals responsible. I am tired of the Citizens against virtually everything. The council is attempting to improve Dunwoody and especially its downtown. Dunwoody needs a special area to attract Restaurants and Galleries as roswell has with canton st. I say lets support our elected officials. We need female leadership. Women listen and generally act accordingly. All women know that men have selective hearing! I have completed this survey, but any market research person will tell you the results to this survey will contain a bias due to the nature of the way the questions were asked. I do appreciate the passion for Dunwoody that your stakeholders have, but I only hope you and the Council can find a way to work together versus as adversaries. I think both parties truly believe they are doing what is best for Dunwoody. Please stop and think of the negativity you are creating in our community and keep in mind we are in a better place than we were before we were our own city. Just a sample size of one. I think the selfish few that are running against these improvements in Dunwoody are not taking in consideration that they are living in a city. If we want to continue to grow and prosper we need to move on from our small town/small minded mentality. I wish you guys would focus on the disaster that our school system has become. That is what is going to bring all our property values down and harm our community. EVEN IF SOME OF THE FINANCING $ COMES FROM THE STATE, SOMEHOW WE ALL END UP PAYING. tHIS IS THE PROBLEM IN cONGRESS. IF SOMEONE ELSE PAYS, IT COSTS NOTHING. OTHER THAN POLICE AND ROAD PAVING, I DON'T THINK THE NEW LAYER OF GOVERNMENT IS A PLUS. DOES THE COUNCIL HAVE TO SPEND TO BE REELECTED? Dunwoody voters should begin to identify now city council candidates for the next elections who share SaveDunwoody.com positions. Was unable to respond to all questions as a result of the screen moving to the next one before questions were answered. PLEASE consult the citizens of Dunwoody PRIOR to the implementation of any and all major projects! I feel like Dunwoody is turning into a police state. I've become more and more unhappy with the changes being made at Brook Run. I miss going there just to be out in nature. The recent construction projects there and this proposed tree removal project infuriates me. Leave Brook Run alone! The Mayor and the City Council do not seem to have common sense. Why spent so much for no good reason. Since Dunwoody has become a city, I have seen no improvements. We are very disappointed in our leadership!!!!!!!!!!! Womack and Vermack can be a regular light during peak traffic times and just a blinking red (as it is now) during non-peak times. We had a round-a-bout near our old neighborhood in Seattle right outside a school and it was HORRIBLE for kids/parents to try and cross the street. It is very obvious the mayor and council do not care what the citizens want. I guess they have forgotten who put them there and they should do the will of the people. Althought I am not opposed to the projects on the table, I am not sure this is wise spending for the city at this time. City of Dunwoody. The city council is not representing the people. What ever happened to government of the people, for the people and by the people? Before we voted for Cityhood we were promised that a big advantage would be "local control" of our city. I don't sense that we, the citizens ,are gaining control. It seems that the Council & non-elected city employees have taken the power.. I think it is time to organized a recall of our current mayor and council. Stop appeasing minority groups such as those wanting bicycle paths everywhere. Enough already! Start listening to the majority of people in our city and stop wasting the taxpayers dollar on frivolous stuff. The Dunwoody City Council needs to listen to their citizens. I think it is time to call for a recall vote on the mayor and city council. Put me down at the top of the recall list! I am very disappointed in the person who like a national told the people what they wanted to hear and is doing the opposite. How can a small group of elected officials and a City Manager do business behind "closed doors" and refuse to listen to the people who elected them. The "rule" that a citizen has three minutes but will not receive a response/comment from any official is tantamount ignoring "public opinion." I would seriously question the bid process and the poor performance results. Don't forget t to call for an examination of the closeness the Chamber of Commerce, Dunwoody Homeowners Association and the owner of a local newspaper. Could it be that the taxpayers are being used as pawns? Dunwoody Village Parkway is very unsafe as a 4 lane road. I strongly support changing it to a 2 lanes, and I also strongly support the installation of sidewalks & bike paths on this road. I am ambivalent about the trees, they are a renewable resource after all. Very serious about my marks on this survey. I'm ready for the folks who oppose plans to make arguments based upon objective facts and to bring alternative designs and proposals (also supported by objective facts) to the table. Simply saying 'no' gets us nowhere. Save Dunwoody is part of our problem, not part of our solution. 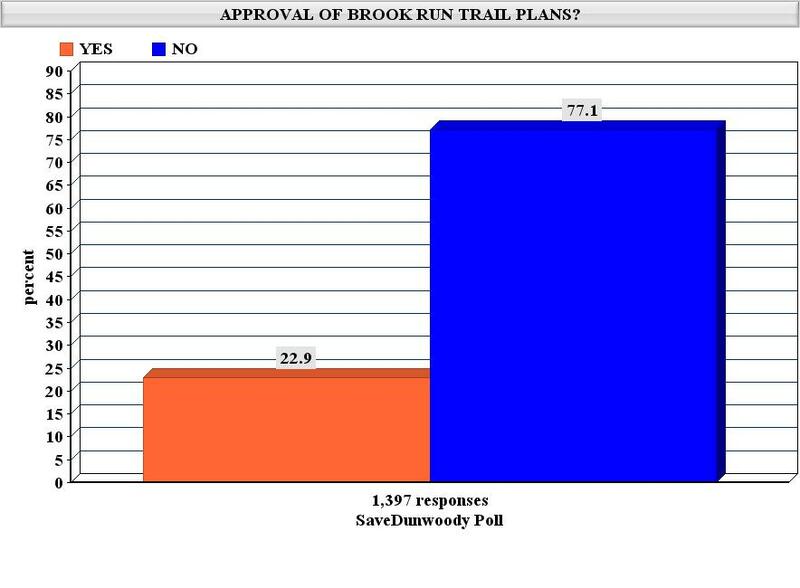 I support a trail in Brook Run park though I'd prefer to stick to the original plan. Roundabouts are incredibly safe and used in Europe very successfully to reduce pedestrian and auto accidents. I would like to see them utilized in Dunwoody. The city council are employees & temp employees at that. The citizens of Dunwoody are their employers. Thanks to the Dunwoody neighbors for taking this stand against the proposed changes to our community. Is there anyway we can recall the Dunwoody mayor? He is drunk with power and thinks he is a dictator with no reponsibility to the people. He has demonstrated time and again irresponsible leadership. I understand Judge has removed the delay and sounds like it is a done job on 12ft. trail. Not happy. This is not a very well designed poll, but what the heck. When items are voted on by the Council and then changed by individual members of the Dunwoody government, that is not fair representation and not the way to spend our money. I didn't vote for a king. I am tired of the condecension of the mayor and Hutmacher. If an unbiased survey was taken, the city council would learn what a large percentage of the citizens are opposed to their actions. Dunwoody doesn't need SAVING. In each example, a new idea that is different has gotten a negative initial reaction, and a vocal few have co-opted the conversation. The many who see these things as signs of long-term progress for the city aren't willing to jump into the fray, since the tone has become nuts. I live near Brook Run, drive through Vermack/Womack twice each day, and shop at the Parkway.... each project is meant to be one step toward overall improvement (circle might be considered standalone, but traffic, overall a larger issue that NEEDS redress). We elected these people to make decisions on our behalf, and that is what they are doing. The consul needs to listen to the people of Dunwoody. It's no wonder Washington is a mess and won't stop spending. We can't even get our local officials to listen to us and stop wasting money. The Council needs to listen to the people of Dunwoody if they want to be re-elected. We n eed to get our prior mayor back in office. The new group is trying to do too much . I have been a resident since 1967 and we like the new stuff when it changed but this new group is trying to do too much. Why do they feel that they have to do all of this junk. Our current City Council should look outside their immediate environs for problem solving inspiration. We do not have to keep reinventing the wheel here. All of our problems have been solved by other communities in this country. I have a student at Dunwoody High School and I think the round about is a great idea. I have seen these work very successfully in past communities. It is important to invest in Dunwoody. I would like to be able to walk to Dunwoody Village and patron future shops and restaurants. Add character to our city like historic Roswell and Norcross. Yes, it costs money, but let's improve Dunwoody so we can increase our home values, attract more families, and have the ability to spend more time here instead of having to get in our cars and travel elsewhere for food and entertainment purposes. Let's stop being so narrow-minded and think about the potential long-term value we can bring to our neighborhood by investing a bit now. Thanks. I do think that something needs to be done about the intersection of Womack and Vermack. I'm just not sure that a roundabout is the solution, mainly because most people don't know how to drive in one. The parents at PCMS are totally clueless about how to use the roundabout there, and same thing with the drivers in the shopping center by Target. The yard signs in Dunwoody have become an eyesore and are now invisible because they have been up for so long It makes our community look cheap. Let's express our voice in more meaningful ways that produce results. anyone who runs for office against these people has my vote. What's wrong with putting a traffic light at Vermack & Womack intersection? The consideration of a round about by 3 schools is not only absurd, it's dangerous and liable of the city council to conisder. Our children are more important than impatinet drivers, and they hardly stop now at a stop sign. A round about is a horrible idea and reckless. It is time for Dunwoody to move forward. Everytime the City of Dunwoody tries to upgrade/improve something a small but vocal group comes forward and stops us from improving our city. I would like to see Dunwoody become a real city not just a suburb of Atlanta with nice streets. Safety is my biggest concern on the Womack/Vermack intersection. This makes no sense to me. Our Mayor and most of the City Council need to listen to the will of the people! Mayor Mike proposed a tennis center. Has he noticed the Sandy Springs Tennis Center & the Blackburn Tennis Center that surround Dunwoody. Neither of these locations make money. Do we need another one? The Vermack Womack instersection is in desperate need of an upgrade! Just scale things down with MINIMAL removal of trees! If we want Dunwoody to continue to be a premier city in the greater Atlanta area, we must realize that change and growth are going to happen. Making our parks more family friendly, trying to ease traffic, and attempting to create a true, pedestrian friendly city center are three great ways to keep Dunwoody moving forward and attracting new families. Relieving traffic is one of the most important items we have to deal with. We don't need a tennis center, either. I am so proud of our mayor and city council for forging ahead with plans for our city. I think many of the projects are forward thinking and will benefit the large amount of families and future families that live in Dunwoody. I have lived in Dunwoody for 12 years and have 3 school age children. Dunwoody Village Parkway is very dangerous as it is right now. I believe it is important to have safe places for our children to walk to. I love trees as much as the next guy. But if you look around the city at the houses and commercial space- you will realize that many trees have been sacrificed in order to have progress. (as are Christmas trees every December. You all need to embrace the fact that some change is good and necessary. Infrastructure improvements cost money. Infrastructure involves the entire community, not just those that live close to needed improvements. I moved here two years ago and chose Dunwoody because of it's charm. If you remove the trees we become like any other city with little charm. We are interested in creative ideas to make dunwoody a more progressive, attractive city!!! The city council should be impeached as the take no consideration for the voice of the people who put them in office. Secret / closed meetings, spending money like drunken sailors and deaf ears are no way to represent the community. I think we need to vote out the whole group. It is just to bad that we have to wait until they come up for re-election. I think the posting of public hearings is a farce since the mayor and council will do whatever they want without regard to the peoples opinion. I would like the center median to remain, but would like a sidewalk. Bike lanes are not necessary. Which council members are up for re-election this fall? All of these plans are consistent with the Comprehensive Land Use Plan that was vetted 4 years ago in public forums for months. We need some Dunwoody attorneys who agree to stop these projects to step in and do some pro bono work. Welcome to Maywoody, the upscale sister city to Mayberry. I hope everyone who voted for cityhood is happy. Yes, the police protection is good, but everything else is turning into squabbling over one project or idea after another. Terry Nall claims the guy he defeated was spending too much money. Now Nall has proposed Dunwoody start its own school system. With what? Why not take control of the fire department and EMS service instead. Others want to cut down mature trees in Brook Run and replace them with little trees that will take a long time to grow. Where's the beauty in that idea. Mayor Davis wants to turn the former GoldKist offices into a sports complex.Yeah right, Mike. Did you forget the voters didn't want to spend money on parks? How did these elected folks get the idea that Dunwoody could become some kind of big time tourist mecca? This parkway nonsense? Does the city really believe their proposal will bring in new and improved business along the parkway while at the same time drawing throngs of residents to take their daily stroll there? Try paving that road first. Then maybe think about narrrowing each lane but preserving the median. I think it's great those who like to ride their bikes on the street should have a lane. On the other hand, I'm damned tired of too many bikers who don't follow the rules of the road and who think it's perfectly ok to ride two or three abreast on a busy street. Better yet, spend the money to fix the damned bumpy dip that the Mt. Vernon/Chamblee Dunwoody Road intersection is. your are wasting money on these projects. I think it's time Dunwoody residents took a hard look and did something about the mayor and council members. They are supposed to be representing us citizens and clearly they are not! I am also in favor of recalling Mike Davis and would be willing to collect signatures to that end. I want Brook Run to be full of children playing. It would be great to have softball and lacrosse fields at Brook Run. I would highly recommend city council to plan a project based on local residents requirements rather than their wish. How about getting busy on repaining the horribly bad roads none the least of which is the intersection Mt. Vernon Road and Chamblee Dunwoody Road and beyond in all directions. The mayor and city council of Dunwoody are acting a lot like Vernon Jones, Dekalbs X CEO.I thought voting to become a city would eliminate that concern for good. I believe I was wrong ! There is so much money being poured into "urbanizing" Dunwoody and Sandy Springs. MARTA and transportation grants are changing the cities that we live in. Goverment is deciding, without regard to the residents wishes, what our cities should look like. SO SAD AFTER LEAVING DEKALB TO PROGRESS THE ELECTED HAVE MADE US REGRESS. We have been residents of Dunwoody for 20 years and are against the recent proposals submitted by the City Council. The Mayor and City Council need to be reminded that we put them into office and we can take them out. And the sooner the better. I wish the mayor and council would reconsider all 3 projects. I know of no one in favor of the projects as outline,. I am most concerned with the roundabout. It seems that would make leaving some developments near that intersection almost impossible!! No more closed door sessions either! City Charter defines "City Council" as including the Mayor. In most municipalities the Mayor is considered separate. Dunwoody Mayor is voting member of City Council, not a tie-breaker. I would support a Round-a-bout at the intersection of N Peachtree and Tilly Mill. My biggest concern right now is the GPC traffic. We had a small voice before we became a city but, now we have NO Voice. We need to march on City Hall and Impeach our Mayor and Fire everyone else!!! We went from the frying pan to the fire when we became a City. These folks in City of Dunwoody government need to be STOPPED NOW!! Davis just said "He wants the City to purchase the building where GoldKist was to do a tennis complex. We shouldn't be in the real estate business when there are people who are struggling to pay their own mortgage. The City is spending money on projects that we don't want and not on want we need. Repave neighbor streets, sidewalks in every neighborhood, make it harder for non-residents to use Dunwoody as a cut-thru,Police at every school in the mornings to slow trafic down, are things that increase our property values and improve the quality of life for the residents of Dunwoody. No more e-mails, talks, etc. now is the time to show our present thru Marching on City Hall, and at the various locations that we do not want to be done!! I don't approve of the removal of lots of trees at brook run, but I do think we need a trail and ball fields and a community swimming pool all we have there now is a (2) million dollar skate board park and a dog park with the acid from dog urin killing the trees. The council is not doing a good job. I'll be voting. The roundabout is dangerous for pedestrians and too expensive. The Village Pkwy is an absolute waste of money. Obviously a biased poll from the start. Most of the elected officals moved here to be a part of a small town. Now they want to change the Dunwoody Lifestyle! Your questions were not worded in an unbiased manner making this survey worthless. Thanks for setting up this poll! I'm not so sure about the Village Parkway plan, but I think that the roundabout is a good idea. Why don't our elected officials understand that they were elected to represent the citizens? Thanks for doing this. It is appreciated. Brook Run. I have not read who approved and signed off for the change from the original proposal. Can that be printed? We live less than a mile from Dunwoody Village and bought our house with the high hopes that the new city would do something with Dunwoody Village. In visiting other areas like Vinings I am in full support gor the city to build a vibrant city center where families can walk to dinner, shops or other activities. I understand the concern for cost, but we do support the concepts and ideas. Re:Womack/Vermack. Why not reconfigure the light to flash red, all sides, as it does not except for the busiest weekday hours. Then the light can go red and green. each side of Womack would get their own green and Vermack could have green both sides together. This works at the intersection of Spalding and Nesbit Ferry. It's not the same kind of intersection, but it's not expensive and walk signals could be added whe the lights aren't flashing for our children's safety. Any thoughts on how many signatures are needed to recall King Davis? How long does it take newly elected "public servants" to become arrogant? I think the entire City Counsel be removed and voted out of office. They don't reflect the community. 15 years ago we were all about replanting the "Dunwoody" forest, now we are all about cutting it down. Only God can make a tree (Joyce Kilmer). Trees that are planted today to replace those that are cut down will take about 100 years to mature and reach the "old growth" that exists at Brook Run now. People don't like change and these things will help our city, they should lighten up on the City Council. I think the traffic in Womack Road should be slowed by putting in more stop signs or using the S shaped traffic islands at intersections along the length of the road. I support upgrades to Villiage, but believe much of the costs could be borne by developers with some mixed use rezoning like at Target instead of by citizen taxpayers. The council seems to have forgotten that they work FOR the citizens of Dunwoody rather than trying to get their names on some projects and wasting our money. We did better with Dekalb county when they ignored us. You shills, do you think we're tricked by you people? Have any of the Design contracts for these Projects been put up for Bid? Thank You! This Survey uses loaded and inflammatory language, guiding the participant toward the answer you want. Shame on you! This save Dunwoody Poll is a great way to find out the consensus of all the people of Dunwoody! Great Idea and easy to do! Nancy Lived in Dunwoody since 1976! What positions are available on the city council this fall? I am not against making changes but I don't feel the time is quite right to be doing all these things. I bounce through pot holes when I travel around Dunwoody and I would like to see those types of things done before we invest a lot of money (and I do think it is a lot of money) in these kinds of changes. I also don't think it is wise to do all these things at once ... really, what is the hurry? The economy is not so good for many people I know and I hate to see our city take on the expense of doing so many things at once. And I personally don't like these particular changes. Especially not now. Thank you. You are the Dunwoody problem. I love what our Council is doing. They're improving our quality of life. Dunwoody Pkwy - leave as is. Has been working well for 38 years I have lived in Dunwoody. Dunwoody Shopping Center is not town center and will never be as long as we have Perimeter. Current owners of of property along route should invest in improvements. More upscale restaurants like Carbonara's and Malones will attract some traffic. I have seen very very few bikers and walkers in area. Womack/Vermack - only busy around school start and stop times. Rest of day (22 out of 24 hours) there is no problem. Current Full Stop sign works fine. Round-about will encourage more cars and not require full stop - not a good idea or desired result. Park - I travel to Europe regularly and enjoy there many fine parks and forests. They do not pave them over with concrete,but instead use natural material fro almost all walkways and paths. That is what we should do. Don't spoil what Mother Nature has provided with a concrete footprint of mankind. We have done enough already to spoil the environment. City Council - City of Dunwoody was a grand idea initially, but is turning out to be just another level of government that does not represent the will of the people and just want to build monuments with their names on the cornerstones. We need to think about Dunwoody's future, not just it's past. One of the reasons we voted for cityhood was to make positive changes that make sense. Fear and denial won't serve our community, but neither will railroading ideas through that don't have a consensus. Why we ever decided to have three schools along Womack with a four-way stop regulating traffic is mind-boggling. I don't want to see a stop light there, but I also hate waiting in a ridiculously long line when I attempt to get to Peachtree Charter Middle School from the Austin area having to pass three schools. Seems the city council has no interest in what the residents of Dunwoody really want. Dunwoody has already been saved - from Dekalb Co. I'm glad that the current city council knows this and is making needed infrastructure improvements that the county has neglected for 20+ years. Each of these projects will GREATLY enhance the city of Dunwoody and the overwhelming majority of our citizens support them, and support our city council. It's travesty for the council to decide NO citizens should be on the parks & rec. board. The dictatorship continues. Please use the money to repair the infrastructure in Dunwoody. We are not truly represented by the Council. the City Manager and Michael Smith have tooooo much power. The Council DOES NOT LISTEN! District 2 neighbors have to put up with Bonser, who should have resigned. She ignores you if you criticize her. We need "HEAR ME" buttons - we are the citizens who have led the PTAs, Boy/Girl Scouts, Job Networks, taught Sunday School classes, etc. We represent many who have made this area so outstanding. these projects are a waste of taxpayer $$!!!! I do not understand why the Brookrun path must be concrete. It is an environmental disaster! I hope that the Mayor & City Coucil members will consider the wishes of Dunwoody residents. Council does not listen to citizens and is hostile to citizen input. Not sure why. They seem to quick to throw lots of money to try to resolve things. The city will be fine and survive if very little is done - as is evidenced when we were not a city and very little was done. The main think is to restrict zoning, enforce speeding, and stop/beat back any projects that change our character. ”Answering your ad: I rate their ruining the quaintness of the ‘old Village’ and trying to glitz it up esp for the ‘cyclist nut on the council’ (a quote from me). And how do they get there ? Sidewalks? That’s a no-no. Bike lanes, I’ve been rear ended twice on Mt. Vernon. The first time my car was destroyed. The second, I’m still having trouble with my hip. A roundabout at that intersection ? That’s crazy! How will the pedestrians (read that kids) cross? The four way stop isn’t perfect. I usually drive that way. Twice I was nearly sent into oblivion when a car speeding straight through nearly hit me when I was turning though I had waited my turn and they were not at the corner – just went through. ”Someone needs to talk to the Mayor, Davis & his people to stop spending money on things not needed and then cry as money is short & there is need to tax people. -Fine people who don’t clean up their dog’s mess and liter. These things are cheaper & remainder funds can be saved! *Note creating more walk ways ,etc in Village Parkway (Biking area) will bring teenage loitering. Also vote no for Davis idea for tennis courts. Can we start a recall to remove the mayor of Dunwoody from office? doesn't want to listen to the populace. My position on the Dunwoody City Council is "neutral". You did not give me that option in your poll. They should glasbead paint the edges of the concrete island installed at Dunwoddy Club/Jett Ferry intersection. Stop spending money on frivolous unnecessary projects. Did these Projects go out for Competitive Bids? What is the relationship between the Members of Council and the Companies awarded the contracts? Thank You! I would like to see a recall campaign launched to remove Mayor Davis from office. The round about is dangerous for children crossing the roads. Every effort should be made to save trees.A 12' wide path seem excessive to me. Wish there were some way to stop these wasteful spending projects before it's too late. Dunwoody is missing out on lots of opportunities. You should get out sometime and look at the Beltline Project, Piedmont Park and other areas that are a center of activity, social gatherings, and economic stimulation. How can we make sure THEY hear us? Trees are already being removed at Brook Run...whats that all about? They aren't listening. A path in Brook Run would be fine...but not 12ft wide and not concrete!! Dunwoody should spend some money on badly needed road repairs for our neighborhoods, not waste it on unwanted, personal projects. Isn't it too late to save the trees in Brook Run?? There are other things that need to be done in Dunwoody, starting with resurfacing our roads. Thank you to the Crier for keeping us updated. I think more money needs to be appropriated to paving our existing roads instead of spending it on consultants for roundabouts, parkways, etc. The owner of Dunwoody Village should be contacted about their future development plans for the Village and let that drive re-configuring the parkway. Very concerned that the mayor and elected representatives have chosen to move ahead with projects that Dunwoody residents clearly do not support. Also, I am not in project that makes it easier for commuters to get through Dunwoody faster. We elected the wrong person for the city of Dunwoody. efforts that result in a re-call election for each and every one of you. 2oo yds with a small expansion of the path to accommodate the benches. It is time for the citizens of Dunwoody to put forward a positive vision for Dunwoody that does not depend on additional taxes and public private partnerships. the roundabout doesn't make sense with all the schools in the area. How about police traffic control twice a day.The other projects will be a non issue in a few years when the benefits outweigh today's controversy. Please stop wasting our tax dollars on projects that only benefit a few city council members who are bike riders. The wording of the questions are not neutral. This site is either strongly biased or does not know how to write fair survey questions. I would like to see a recall of our mayor. DHA seems to have too much power in city gov,t. This is what we had under DC. I am very unhappy with the mayor and city council. Do you want Dunwoody to live in the past? Keep fighting every change. Vote them out next go around. Many other Atlanta suburbs spend money and have amazing amenities. We need to stop being cheap + do some things that will make a difference. This bunch of elected officials seems bent on doing everything EXCEPT keeping the citizens who elected them informed, or LISTENING to said citizens. DUNWOODY? THIS IS TYPICAL GOVERNMENT CRAP, DOING WHAT THEY WANT. THEY NEED TO ALL BE FIRED!!!! A third choice of "undecided" would have been better than only yes or no. Mike Davis and team are a bit out of control with these unneccessry projects. I fully support removing the mayor from office. Dunwoody is wasting money when our roads and sidewalks need to be maintained. This government is a major disappointment and should be recalled!!!! They are doing things most Dunwoody citizens do not want. The mayor and some city council members believe they know what the majority of citizens want in these 3 projects. But, they don't. I am for progress, but also being financially responsible. The Chamber of Commerce did not elect the council, the citizens did. Every week, I pick up the Crier, there is a new project. Stop being so arrogant, lest you be turned out of office. planted anywhere, not to mention the trees on the parkway are nothing special. with words like "escalating costs," are biased. Dunwoody City Council and Masyor have run off the rails. This is not representative local government, but Development Nonsense. They all should resign, erffective immediately. I feel the city council does not care at all what the citizens of dunwoody want. Hey, hey, ho, ho, Davis and Nall and shorter have got to go! Dubwoody needs to evolve to market and attract a newer younger demographic who spends money in our town. These steps make positive steps to get us out of the 80's. We have a nice infrastructure but no destinations. Parkway creates the right environment for good business expansion. Trail is a nice destination that will expand and link neighborhoods. Instead of a traffic circle, which is not safe for pedestrians, there should be a traffic light. I am very exited about the new plans. I have discussed plans w a city planner and he tells me this will be a wonderful step forward. The focus should be to first repave our roads (they are horrible) and educate our children....parks and bike lanes can wait! I think that city council making a decision i disagree with dies not necessarily mean they are not listening. I also resent any group speaking collectively on behalf of the community without ever coming and asking what we think. The roundabout issue is tough...i neither agree nor disagree. Please tell Mayor Davis that we have the next vote in the next election. He's been a real disappointment. I voted for him based on what people who knew him said about him. I would like to see some landscaping to the existing parkway, but not the changes they are forcing through. I cannot see why we would need a 12 ft wide path in Brook Run. I wish these questions were not so obviously biased. I believe a professional pollster could have helped to craft appropriately neutral questions. areas at brook run and use the old library for the city hall, jail, and court house. I think the Dunwoody Village area needs to be revitalized. I just don't think the current plan or expenditure is appropriate. With so many people voicing their opinions against these 3 projects, I can't believe that our City Council would go ahead and spend all that money for projects the citizens don't want. I feel we need to get these people off the council and get new people on. We need to recall Mayor Davis. Dunwoody ask yourself who you want to be. Don't follow the spending trend that our federal gov. is taking, it leads to problems. Stop spending our money!!! This is our city, not yours. I voted most of them in, and look forward to being able to vote them back out. The city council as a whole appears to operating as if it an autocracy with Emperor Davis pulling the strings. It's odd to me where each council member was elected separately that there would be so much homogenous thought and apparent beliefs/philosophy. What the hell happened to the great hopes of the City of Dunwoody? Keep in mind that the loudest citizens don't necessarily represent the majority. I think the proposed measures will benefit our community and is a departure from the hands off attitude we have endured for years under DeKalb County governance. I will sign a recall petition. The questions in the poll are somewhat biased in the way that they are posed, tending to elicit a desired repsonse. Nevertheless, my repsonses are representative of my opinion. A recall sounds good to me! Impeach the Mayor. He bought his election by throwing keg parties. Fix our roads. Mt Vernon is an obstacle course. My family and I have lived in Dunwoody since 1973 and have witnessed the god & bad things that have happened since then. Unfortunately, We are very dissatisfied with our current City Council & especially the Mayor who is not worthy of the office. THe council may not be doing everything perfectly; but ti seems like there are way too many people who are against any change. We need to march on City Hall!! We need to impeach our Mayor,etc!! Make Dunwoody Better! Thank you city council! I voted for the city of Dunwoody for exactly these reasons. I want to see these changes. I want a "community" not just to save money. I hope, but am skeptical, that this will have an effect on our tone deaf city government or manager. We who oppose are a noisey small group while bikers (I did see a couple the other day.) are a large and reasoned majority. I am especially disgusted with the plans for Brooke Run Park. I am unhappy that money too much money is being spent on non-essential projects ( The Village Parkway, 12ft. concrete multiuse trail, a roundabout in a residential neighborhood) instead of on needed improvements, especilly potholes on our roads.. Please encourage your supporters to remove the blight of the multiple "save" signs.